A Nest Amid Thorns: OMG OMG PAINTED BUNTING - IN MY YARD!!! 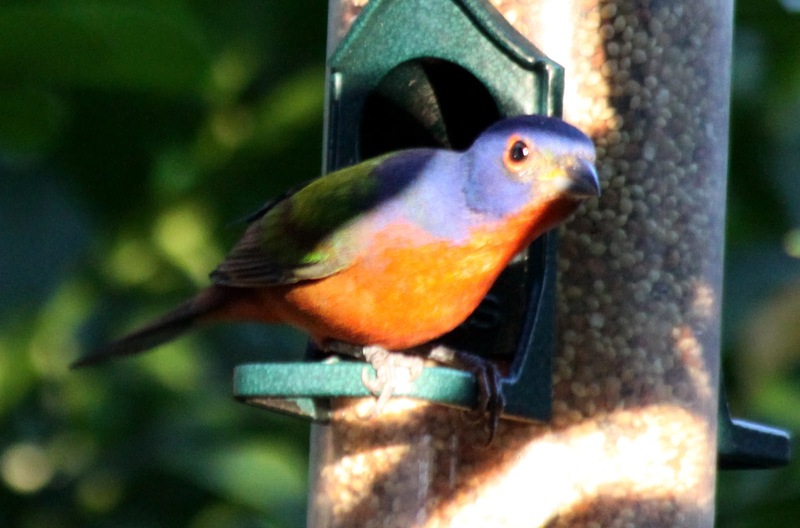 OMG OMG PAINTED BUNTING - IN MY YARD!!! Yes - you read that right. 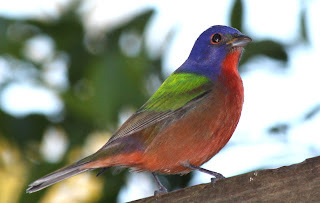 For the first time in my life, except for MAYBE one time 7 years ago when there MIGHT have been a female Painted Bunting in our yard (their color is all green), we had the apex, the climax, the utmost B.I.R.D. for me in our yard this morning. 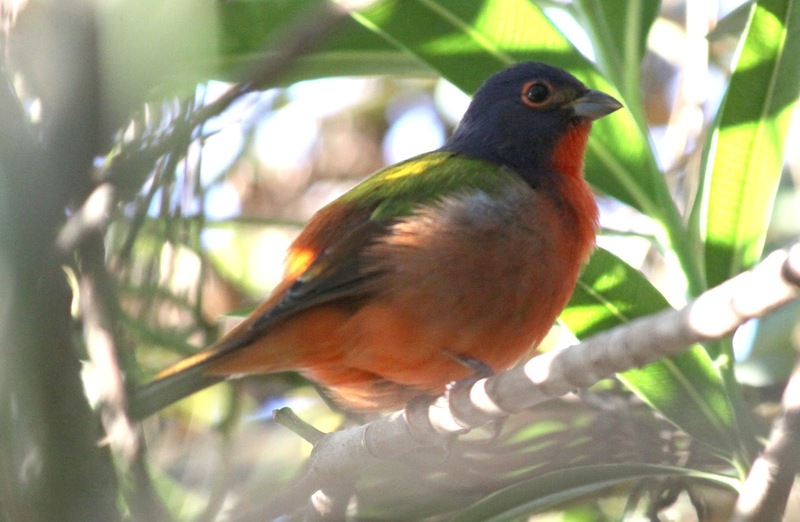 Below is the poor photo from 2006 of what I thought might be a female Painted Bunting. 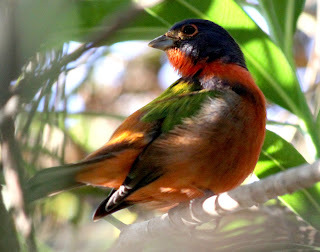 Wait for it.....here it comes......tom ta da da.......a PAINTED BUNTING - MALE. 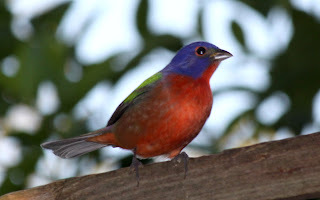 My husband and I have always joked that once we have a Painted Bunting in our yard, we can move. 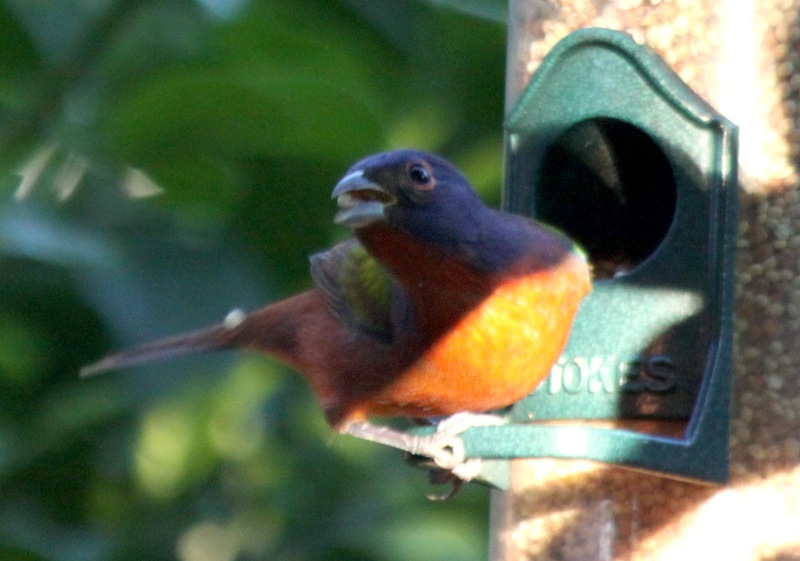 We will have achieved all there is to achieve in back yard bird feeding. We've had a tired Cardinal (he was migrating, hence his bar fight looks), which we thought was exciting, because we never get Cardinals. 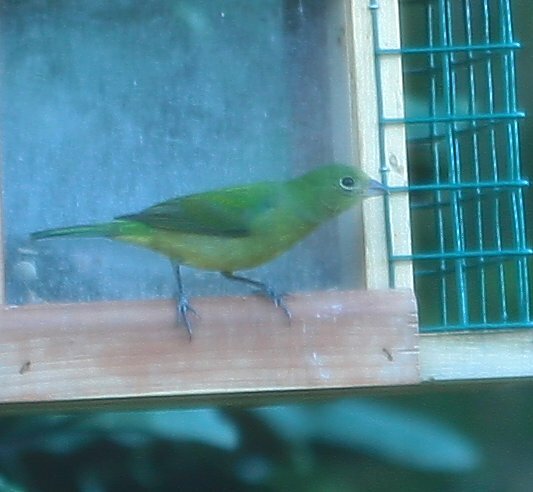 We've had American Redstarts, both male and female. 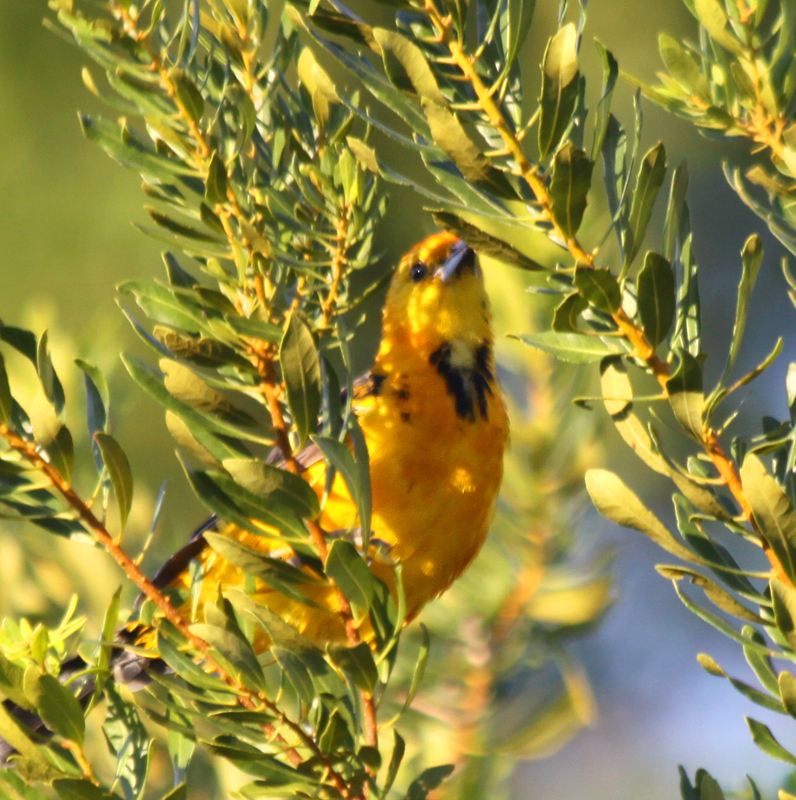 We've had Common Yellowthroats, Nanday Conures (a parrot species), Yellow Rumped Warblers and Palm Warblers. But never have we had a Painted Bunting. Heck - we've gone out into the Everglades to see them and didn't see any. We've gone to places where birders said they've seen tons of them - nada. This lady doesn't get them until December, so I wonder why this one is here so early - and in Eastern Florida, which is far more rare than Western Florida, where Pollywog Creek is published. I've died and gone to heaven. Life will be on a downtrend after this - what could be better than this??? 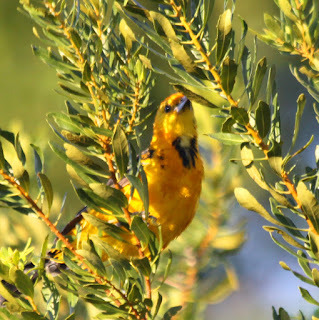 The last fellow is a Spot Breasted Oriole, which we've had in our yard before. There were 2 of them this morning. They are my husband's favorite bird and South Florida is the northern limits of their range. They are really a tropical Oriole. What a fabulous morning!!! I rarely take the time to comment but I must say that is the most beautiful bird! No wonder you are so excited. We have a family of cardinals which stay here all year. The bush they nest in is right in my line of sight from my kitchen window. In the midst of a snow when everything outside is white, their red color is magic! Brenda - thanks for commenting! 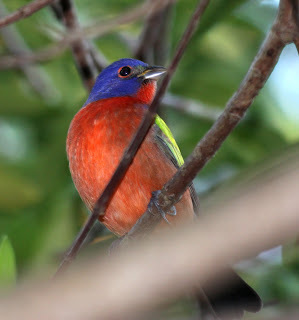 I'm still in bird heaven - I've wanted to photograph a Painted Bunting for years - anywhere in South Florida. I NEVER thought I'd see one in my own back yard. Cardinals ARE beautiful, especially in the winter when all is black and white - what a treat that must be for you! How exciting!!! Those are great photos, Suze. Interesting, too, because yesterday I thought I saw a spot of bright red in the thickets along our pond...which is usually where I see the PB first. I dismissed it thinking it is much too early, but maybe not. We've had a couple of hawks hanging around lately, so that might keep the PB's away for a while. I'm really excited for you, Suze. These birds truly are a gift. Thanks Patricia - I LOVE to read your blog and most of all - to look at your photographs. They are all exquisite. Congrats Kiddo - really great pictures too . .so where are you moving to?????? I'm so tickled for you! I don't think we've ever had one in this yard, but we have had several Rose-breasted Grosbeaks the past few days. It's the first time (that we know of) they've actually come to our feeders and we're so excited over it! Looks like it's going to be a great birding season! Cheryl - who the heck knows? Probably nowhere. Sophie - I wonder if it's going to be a bad winter, so the birds are heading out early?? Now that, is true inspiration! Hi my name's Ben and I was passing through and saw this, and thought how well this connects to my own blog. My blog is called connect to be moved and is hosted at www.connecttobebemoved.com Please take a look, I have a feeling you'll enjoy it :)!